﻿ Military Readiness from the Grunts’ Perspective: Why do we Get Such a Different Story on Military Readiness When the Real Experts Speak Up? Military Readiness from the Grunts’ Perspective: Why do we Get Such a Different Story on Military Readiness When the Real Experts Speak Up? Some of us who grew up between the U.S. wars in Korea and Vietnam fondly remember Art Linkletter’s House Party. It was a show for our Moms, but when we had to stay home sick from school, drinking ginger ale and eating saltines, we’d get to watch it in the middle of the afternoon. I recall nothing of the show except his Q&As with kids at the end of each program, eliciting their take on the truth. “You’re a diplomat?” Linkletter asked one kid after a particularly deft answer. “No,” he responded quickly. “I’m a Catholic Baptist.” Another, when asked how Dad helped Mom around the house, said: “He makes cocktails.” The kids weren’t wrong. They just saw truth from a different angle. 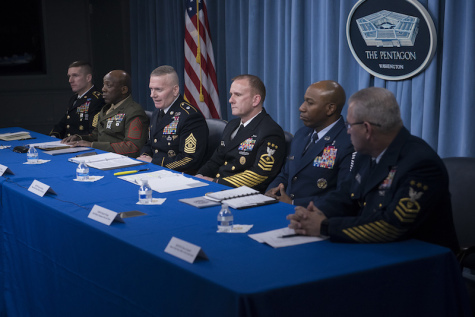 These memories came flooding back Nov. 27 after the nation’s top enlisted troops sat in the glare of the Pentagon briefing room and gamely responded to questions from reporters. These six men represent all the soldiers and sailors who do the actual fighting, and not the officers in command. They’re down in the weeds, so to speak, that surround every foxhole. And they declared, contrary to what their superiors, including the president of the United States, have said, that there is no readiness crisis in the U.S. military. “I don’t think we’re in crisis right now,” said Army Command Sergeant Major John Troxell, who serves as the senior grunt for the Joint Chiefs of Staff. But that’s not what we’ve been hearing for months. Defense Secretary Jim Mattis declared himself “shocked by what I’ve seen with our readiness to fight” when he signed up as Trump’s defense secretary four years after hanging up his Marine uniform. The armed services committees are pushing for a nearly $700 billion defense budget for 2018, well above the $668 billion sought by Trump, which itself was $54 billion more than allowed under a 2011 legal ceiling. The impending cash flood is supposed to “help reverse the dangerous readiness crisis that is endangering the lives of our men and women in uniform,” congressional defense leaders said earlier this month. Here’s some ground truth: The DNA of the military-industrial complex makes it exaggerate every threat, and propose a solution to wipe it out. So why haven’t you heard of the enlisted leaders’ lack of readiness concerns? Well, first of all it’s not surprising. When senior leaders warn that the U.S. military is at the ragged edge of readiness, it leads to headlines around the world. But contrary views—boring!—don’t. Both the government and press like threats, no matter how trivial (EMP, anyone?). They act like acetylcholine, the neurotransmitter in your body that instantaneously translates threatening thoughts into spasmodic muscle movement. It’s too bad, because unlike most of their “superiors,” the nation’s non-commissioned officer corps—the senior sergeants of the Army, Air Force and Marines, and the Navy’s chief petty officers—are the ones with the most perspective on the topic. The enlisted corps are the guys and gals at the tip of the war-fighting spear, instead of stroking their chins, barking orders, and then writing books about it. Their senior ranks have the optimum combination of experience and execution. They have the standing to tell the rest of us what is going on: immune to (national, partisan) politics, they’re deeply steeped in the levers and pulleys that make the U.S. military work as well as it does. Those answering reporters’ questions on readiness average 30 years or more in uniform, much of it spent on the front lines since 9/11. For decades, U.S. military leaders and politicians have hailed NCOs as the “backbone” of the U.S. military. My flashback to Art Linkletter isn’t meant to suggest that the members of the Defense Senior Enlisted Leader Council are child-like. Far from it. It simply means that they often see the world differently than top military officers and their overlords in the White House and Capitol Hill. They have climbed to the peak of the 1.1 million enlisted troops in the U.S. military (compared to 229,000 officers) more by grit and determination, and less by the sweet-talking Teflon and WD-40 favored by those with constellations on their shoulders. Their comments seem refreshing not only because they mesh with reality—the woes the U.S. currently faces can’t be handled by pumping trillions more into military force—but because the senior ranks of the U.S. military are, according to some experts, marbled with mediocrity and mendacity. This isn’t true across the board, of course, just as all NCOs are not unvarnished truth-tellers. There are undeniable strains on the force after 16 years of nonstop war. But the debate over military readiness is perpetual in a democracy, as it should be. Your view that the canteen is half-full—or half-empty—depends on how you want to balance U.S. military commitments with risk. The key thing is that neither side has a monopoly on truth. Both are right, in fact. Just like those kids on Art Linkletter’s show. “No other nation in the world empowers and entrusts enlisted leaders like we do,” said Troxell, the nation’s top enlisted soldier. Presumably, they’re also entrusted to tell their truth.